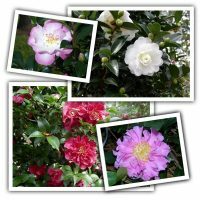 As summer fades and we finally start to cool down, the October Magic Series usher in the camellia season in beautiful fashion. Graceful in form and one of the loveliest of autumn flowers, the soft fragrance of sasanquas conjure up memories of southern gardens amass with blooms. These new selections offer all of the nuances we’ve grown to love in sasanquas and then some. There’s a shape, size and color to fit any garden.